​ ​​​​​​​​Welcome to the MDMOC membership portal. We invite ALL midwives, students of color, and supporters with similar interests to join us!! 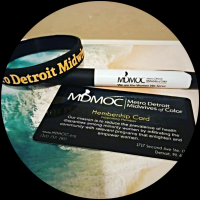 As a member of MDMOC you will be connected with health professionals and organizations that seek to improve the state of health amongst minority women in Metro Detroit. You will be actively involved in the development and execution of initiatives that address the relevant needs of your community. Membership provides opportunities for professional growth and development, peer networking , educational seminars and mentorship. Your membership declares your commitment to change and support in shaping the future of midwifery in Metro Detroit. Only Active Members are eligible to vote on matters submitted to the Members by the Board of Directors. An Active Member may hold an elective office in the Corporation and serve on the Board of Directors, or any committee thereof. A Student Member is current student of color currently pursuing a career in midwifery. Student Members are not eligible to vote on matters submitted to the Members and may not hold an elective or appointive office in the Corporation, except Student Members may serve as a committee member. A Supporting Member is an individual who does not qualify as an Active Member or Student Member, but who is interested in supporting the goals and initiatives of the organization.